Looking for a science project that allows your child to be creative, build, and learn some science as well? 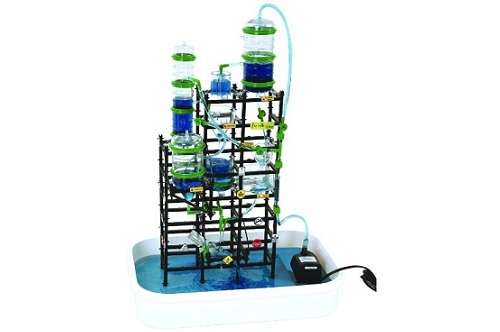 The Girder and Panel 300 Piece Hydrodynamic Deluxe Set will not leave you disappointed. Add water and your imagination for hours of creative fun and science exploration. Children will engineer structures, learn how a siphon works, and discover basic principles of fluid dynamics. They can use their imagination to build scale models of ice cream factories, oil refineries, water treatment plants, distillation plants, and other industrial structures. ids enjoy testing their ability to balance the water flow through the tanks by opening and closing valves. This set comes with a large tray and footing in which you build the structure. The tray measures approximately 10 inches by 16 inches by 3 inches deep. The tray and the footing are both white. The footing has a grid of 12 holes for columns (4 x 3 configuration). 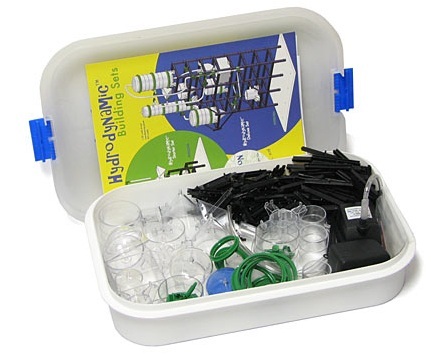 Build the structure using the footing in the tray for the base, place the submersible pump in the tray, add water until you completely cover the inlet on the pump, and then enjoy re-configuring the pipes, opening and closing valves and watching the action! When you take the set down, all the parts pack into the tray, the plastic lid snaps on and it can be safely stored away for future use. This Deluxe Set includes: electric pump (12V AC), siphon tank, large square tank, small and large round and cone bottom tanks, float valve, tilt scale, ball float meter, water wheel, assorted valves, pipe holders, pipe. 1/87 scale of a real manufacturing plant (HO scale). Includes full-color instruction book. Recommended for ages 10 years and older.